Now before you all get excited or annoyed that I ran off and got married in secret I should tell you straight away that the first wedding anniversary I’m referring to here is my daughters! I wanted to enter this piece in the White With 1 Challenge since it fits so well and in order to do that I needed to have it on my blog. February’s challenge is WHITE + PINK + HEARTS so it’s perfect. Since this photo was taken, John framed it with a white floating frame and it now hangs proudly in Rebecca and Greg’s kitchen. I love that so much of the picture is directly related to their wedding. It was created on a 12″ x 16″ canvas using acrylic paints and mediums. Although it looks slightly squiffy in the picture it’s not. That’s just my poor photographic skills! The poem is printed on white tissue paper and was attached with gel medium. It’s the one I read during the ceremony, awwwww! 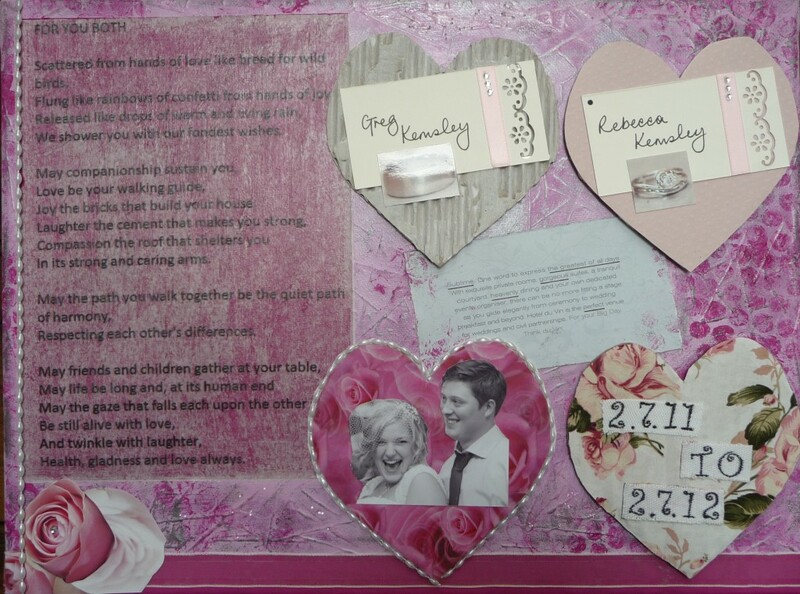 The grey card was torn from the hotel’s wedding brochure with special words underlined. The deep pink roses paper in the left bottom heart is shop bought whilst the pale pink is paper Rebecca embossed herself. 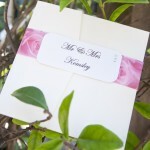 She used both in her wedding invitation packets. 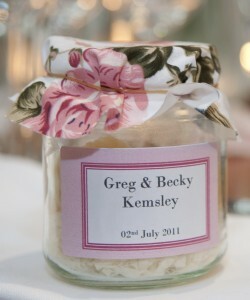 The rose material heart was taken from the lid cover of the homemade fudge wedding favours. The name cards are the ones Rebecca made for their places on the top table. 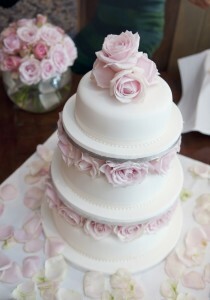 The white beads and ribbon along the bottom came from the wedding cake. The roses in the left bottom hand corner are from a photo of Rebecca’s bouquet. It’s been a lovely trip down memory lane going through the wedding photographs to write this post. So many beautiful memories of a very special day. Hmmmm. Not sure how I’m going to follow that for this year’s present? !